In the soft glow of starlight. During the September days Kossuth was already playing a leading role in every particular. He managed to obtain the House’s consent for the election of a small permanent committee to assist the Prime Minister; this soon became the National Defence Committee, which on 8 October took over the government under the leadership of Kossuth as its newly-elected President. The court no longer regarded the government as Hungary’s legitimate representative, and appointed Field-Marshal Count Ferenc Lamberg, a moderate Hungarian magnate, as royal commissioner and commander-in-chief of all armed forces in Hungary. Simultaneously, a little-known politician was entrusted with forming a new government in place of Batthyány’s. Meanwhile the palatine as well as Batthyány resigned. Lamberg’s appointment, not endorsed by the acting Prime Minister, caused general indignation, and shortly after his arrival from Vienna, in broad daylight, the “traitor” was dragged from his carriage by an enraged mob and lynched. King Ferdinand immediately dissolved the National Assembly, declared a state of siege, and appointed General Jelačić royal plenipotentiary and commander-in-chief. However, Jelačić could not assume the absolute powers conferred on him because on 29 September his army was beaten by a Hungarian unit at Pákozd near Pest, and his troops were now marching not towards Pest-Buda but in the opposite direction. Just over a week later the Second Croatian Army suffered a shattering defeat at Ozora south of Lake Balaton. Both victories, which temporarily saved the capital and the Revolution, were celebrated in poetry and drama. Several days later, again on Kossuth’s recommendation, Parliament declared the royal manifesto null and void. Open war between Hungary and Austria was now inevitable. On that day Kossuth’s reign began: between September 1848 and April 1849, as president of the National Defence Committee, he became de facto “temporary dictator dependent on parliament”, i.e. for the duration of the crisis. Kossuth was not only the political leader, but also the inspiration, the organizer and the chief propagandist of the fight. That the Revolution was carried through into a War of Independence and that the nation chose the road of armed resistance, was doubtless due in the first place to the charismatic aura of this veritable tribune of the people. Much has been written by historians and former associates about his negative traits: his jealousy and vanity, coldness and egotism, his inability to put himself in the place of opponents, and lack of understanding of the concerns of the nationalities. His illusions about foreign politics are perhaps best explained by the fact that until 1849 he had never set foot anywhere west of Vienna. Of his generals he encouraged incompetent ones and persecuted Artúr Görgey, the most gifted; he drove them into battle when all hope of winning the war has gone. Why then did people forgive Kossuth everything? He was the liberator personified; he was the one who did away with the last vestiges of feudalism, freed the peasants, emancipated the Jews, promoted industry. But above all he embodied—not only for his compatriots—the concept of independence. The Vienna October Revolution was a turning-point in Austrian history, with far-reaching consequences for Hungary’s future as well. The rising of workers and students broke out on 6 October. The spark that ignited the tinderbox of accumulated discontent was the mutiny of a Grenadier battalion of the Viennese garrison, which the Minister of War, Latour, wanted to send to the aid of Jelačić in Hungary. Latour himself was attacked and lynched in the Ministry building and his mangled corpse was strung up on a lamppost. The Emperor, the Court and the highest officials fled to Olmütz in Moravia. The appeal by the revolutionary German poet Ferdinand Freiligrath in his poem “Wien” (Vienna) to the Germans to rise up was just as futile as the hope that the Hungarian revolutionary troops would succeed in relieving Vienna from the besieging Imperial troops. The Austrian-Croatian Imperial Army defeated the somewhat reluctantly advancing small Hungarian force at Schwechat. On 31 October Field-Marshal Windisch-Graetz marched into Vienna, drowned the uprising in a bloodbath, and set up a military dictatorship which lasted till 1853. The Polish revolutionary General Józef Bem managed to flee, but First Lieutenant Messenhauser who had refused to turn his guns against the people, was executed together with a number of radicals, among them Robert Blum, a deputy of the Frankfurt Assembly. Both sides now armed for war. Austria had gained a new prime minister in the person of the diplomat and general Prince Felix Schwarzenberg, incidentally brother-in-law of the ambitious Windisch-Graetz: he was, in Robert A. Kann’s assessment, “an adventurer and political gambler”. Radetzky controlled Northern Italy and Windisch-Graetz became commander-in-chief of the impending campaign against the Hungarian rebels. Schwarzenberg, together with Archduchess Sophie, succeeded in persuading Emperor Ferdinand to abdicate in favour of Archduke Franz, his eighteen-year-old nephew and the Archduchess’s son. The change of rulers took place on 2 December 1848. The arrogant and imperialistic Schwarzenberg (Széchenyi called him a “cold-blooded vampire”) was determined once and for all to downgrade Hungary to the level of a province. The new Emperor, who added to his name that of Joseph to signify his recognition of enlightened “Josephinismus”, relied on Schwarzenberg as he did on none of his subsequent advisers. The consequences of this reliance were more than questionable: thus, for example, the forcible dissolution of the Austrian Reichstag at Kremsier and the arrest of several deputies in March 1849. Meanwhile the Magyars refused in mid-December to recognize the new Emperor as their king, because he had not been crowned with the Crown of St Stephen and did not feel bound by the royal oath of his predecessors. Kossuth had not intended this conclusive break, but probably welcomed it. In December Austrian troops attacked Hungary from all sides. A peace mission to Vienna of moderate Hungarian politicians, among them the former Prime Minister Batthyány and the Minister of Justice Deák, failed; Windisch-Graetz refused even to receive them. The Hungarians were fenced in from all sides. Parts of the Austrian army under General Schlick attacked from Galicia in the north, and in the south-west the Romanians and Saxons joined the offensive. The Serbs advanced from the south, the Croats approached across the Dráva and the Danube, and Windisch-Graetz struck from the west. They occupied Buda-Pest in January 1849, and Kossuth fled with the deputies and officials—altogether about 2,000—to Debrecen, 220 km. to the east. The provisional capital was no more than a giant village, with only a single doctor in private practice, but as a centre of Calvinism it counted not only as the most distant town from the attacking Austrian army, but also as a symbol of resistance to the Catholic Habsburgs. By the end of 1848 all appeared lost for the Magyars; the Austrians believed they had throttled the Hungarian Revolution “as in the coils of a boa-constrictor”, as Friedrich Engels wrote in the Neue Rheinische Zeitung. Yet the Hungarians fought on with ever-increasing ferocity, though with varying success. Windisch-Graetz proved a rather ineffective commander, and fell victim to his own vanity as well as to the tactical superiority of the Hungarian revolutionary generals. After a strategically unimportant victory at Kápolna, to the east of Buda-Pest, over troops led by the Polish General Henryk Dembinski, Windisch-Graetz believed that the Hungarians had been finally beaten, and in a report to the Court, which was still at Olmütz, announced his imminent entry into Debrecen. This ill-considered move led to the abovementioned imposed constitution of 4 March, which gave the resisting Hungarians an enormous psychological boost to their by now victorious military campaign against Austria. On 14 April 1849 the Hungarians replied to the proclamation of the octroied (granted) constitution, which eliminated Hungary’s ancient rights and denied it Croatia-Slavonia, Dalmatia and Transylvania, with a psychologically understandable but politically unwise “Declaration of Independence”. In it the parliament in the great Calvinist church at Debrecen proclaimed the dethronement of the House of Habsburg-Lorraine, Kossuth was unanimously elected provisional Head of State with the title of “Governor-President” and Bertalan Szemere Minister of the Interior. Hungary was isolated, yet its army fought on with such success that many people spoke of a “springtime miracle”. One of the revolutionaries’ principal demands was the creation of a national army with Hungarian as the language of command. Commands, however, still had to be drafted and conveyed in German, because many of the key officers did not understand a word of Hungarian. One of Kossuth’s most devoted associates was the Englishman General Richard Guyon, who had been a first lieutenant in a Hungarian hussar regiment before the Revolution and who, having a Hungarian wife, had become an ardent Magyar patriot. Another of the numerous foreign professional officers was General Count Karl Leiningen-Westerburg, a member of the Hessian ruling house and related to the Coburgs and hence the English royal house; through marriage and predilection he also became Hungarian. 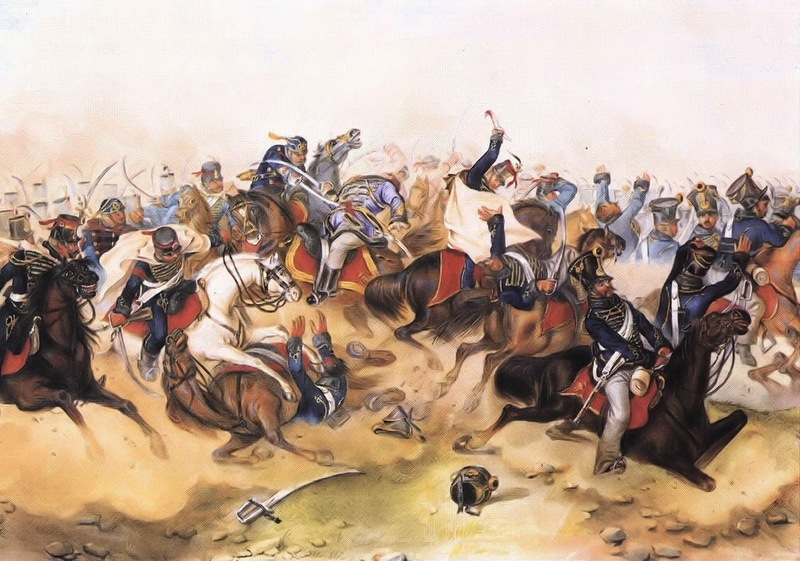 In the autumn of 1849 close on 50,000 members of the Imperial-Royal army were fighting on the Hungarian side, including about 1,500 professional officers. These regular units were not integrated into the new honvéd army; the soldiers kept their uniforms, leading to tragicomic misunderstandings, since it was often impossible to differentiate between friend and foe. The bugle and drum signals, the drill and, as already mentioned, the language of command remained the same. At least 1,000 officers or approximately 10 per cent of the Habsburg officer corps decided in favour of the Hungarian cause. The military historian Gábor Bona estimates that of the honvéd army’s 830 generals and staff officers 15.5 per cent were Germans, 4.2 per cent Poles and 3.6 per cent Serbs and Croats. The cosmopolitan character of the revolutionary force was maintained from the hopeful beginning to the bitter end of the War of Independence. Hungarians of German origin (excluding the Transylvanian Saxons) generally stood by the Magyars, as did many Slovaks and, without exception, the Jews who hoped for emancipation. About 3,000 Poles, many of them officers, fought for the Magyars. But it was first and foremost Kossuth who, with his dynamism and incorrigible optimism, supplied the motley army with tens of thousands of recruits, with arms and munitions from abroad, and eventually created a war industry out of nothing. By June 1849 Kossuth succeeded in mustering a honvéd army of 170,000.